So I got the shock mount sorted out, got it started and went for a ride. It ran very badly, not backfiring but reluctant to rev and just low on power. Also the new clutch needs adjusted and so do the gear cables. Back to the shed and out with the spark plug and off with the flywheel. I took the points out to clean them then set the timing with the aid of a screw driver in the bore so I could see where TDC was, made a mark on the case, tightened everything back up and put the flywheel back on. I put the spark plug back in and tried starting it. Bizarrely it started straight away and eventually after adjusting the idle screw it sat there idling – things are looking up! After a couple of stops and starts It was onto the wiring to see what was happening there. 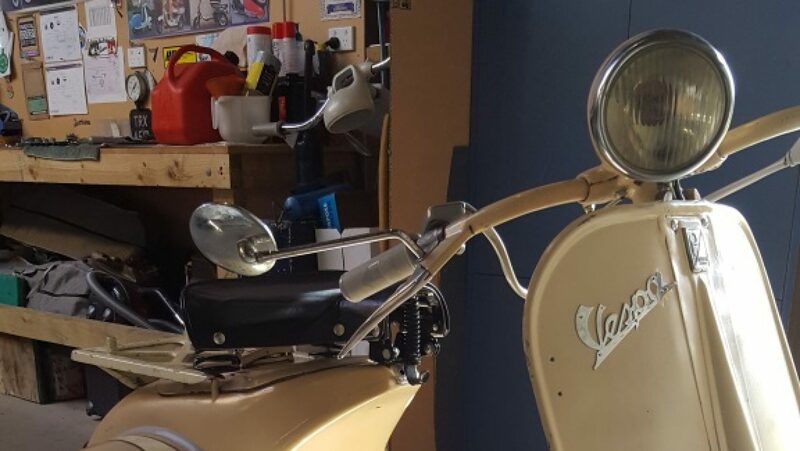 I had replaced the entire loom when I installed the CDI kit as per the scoots rs website so the cabling and wiring colors weren’t the same as a standard Super plus the brake light switch was reversed and there was now an ignition key in the mix. Goody…..
With the adjusted timing now running the motor, I just had to figure out what wire went where, so out with the tank and into the wiring loom. I followed the wires as per the original CDI kit then compared that to a Supers wiring from google and figured out that the yellow wire should run the lights so adjusted the cabling to suit and ran another wire to the yellow terminal. After putting everything back together, I started it up and bugger me – we have lights!! The headlight and horn worked and so did the brake light/tail light. The kill switch and ignition switch worked. The lights weren’t very bright but that was because they were 12v ones as I didn’t have a complete set of 6v ones. So I put more fuel in it and took it for a ride up the road. It ran pretty good to be fair and the lights were working until I got back to the shed…. Sure enough the lights were dead but the bike was running good and idling so thats a good result at this stage!! glad to hear your Bajaj is coming along. My ones been a bit of a mission but to be fair I have learnt a hell of a lot because of it. You say theres some play in the front end ? its not the steering head bearings is it?